Dr Hilde Roex is the co-ordinator of the second year organic chemistry laboratory course of the Chemistry Program (Gasthuisberg campus, Faculty Management & Technology). Here, the students apply NMR in their organic chemistry laboratory to identify the molecular structure of their synthesized products. They are taught to see the value of NMR for quality control and its use alongside other analytical methods including gas and liquid chromatography. Their goal is to be able to interpret proton NMR spectra and to learn that proton NMR and FT-IR spectroscopy are complementary techniques. This helps to make students familiar with NMR showing them applications of its wide use in industry. UCLL chose the Magritek Spinsolve Benchtop NMR due to its ease of use. Sample loading and cleaning is simple compared to competitive models that use tubing rather than standard 5 mm NMR sample tubes. Magritek’s Spinsolve resembles the performance of a superconducting NMR and fits closer to theory too. Running a spectrum is very simple, yet very effective as illustrated in the examples from the students’ practical sessions. Dr Roex explains the method she used with this year’s second semester group of students. Students had to synthesise an alkyl bromide out of an unknown alcohol, as described in literature. 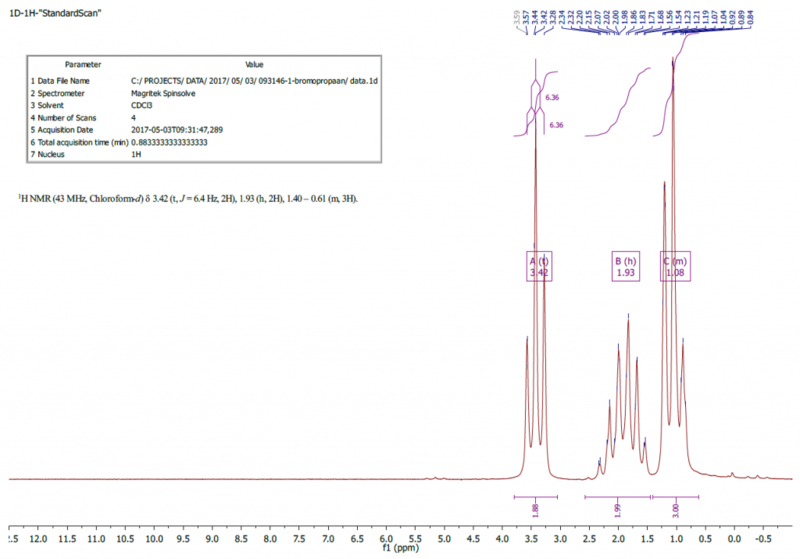 Next, they had to control the purity and interpret the 1H NMR spectrum of their obtained alkyl bromide. Finally, they had to define their unknown alcohol by comparing its spectrum with a range of pre-defined alcohol spectra.